The title basically says all of it. The first bus I ever remember riding on was an Edwards Coaches Mercedes-Benz O405 with a PMC 'Metro 90' body. I think I was about five. I remember that day I was in town with my mother and we were about to walk back to our house, but I suggested to her that we would catch the bus instead. My mother agreed and so we caught the bus home. I was fascinated by the vehicle and that ride was one of the things that got me interested in buses. Sadly, I never knew which one of the O405s I rode on that day (Edwards own two of them). Those O405s have since been replaced in the route services by MAN 15.220 midibuses, and since their replacement, the O405s have been doing school runs to the present day. My father used to be a Mechanic for MMTB Bus/MetBus and I used to get to ride around the depot* and I'd sit on his knee as he'd take buses through the wash. I think it may have been a Denning but I'm not certain. Anyhow, we rode it from Wilcannia to Broken Hill...big adventure! A Ventura Tiger brand new in 1985 to go to the dentist with Mum when I was three. Evans at Fairfield, so it would probably have been some form of Bedford. Stop the World... I want to get off. I don't remember but it probably would've been a later series CNG Mercedes Benz O305 from 1986 as they would've served the area I was living around for ages. 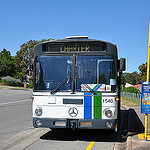 Merc O305 in Sydney, circa 1985. 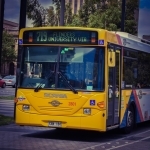 A MAN NL202/Volgren CR221L on Route 800 from Oakleigh to Dandeong. Would of been 1995/96. My earliest memories of PT here in Adelaide coincide approximately with the time that mum got rid of her car. So it's hard to say if I even used PT until about 1991. 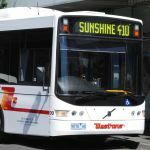 In 1996, Transadelaide finally retired the last of the Red Hens, which I've never really looked upon that favourably due to the strong smell that greeted you upon boarding, and the fact that many were very run down in their final years, more or less resembling wrecks on wheels. It's not unreasonable to assume though that this hostile impression of them came about from being one of my very first experiences with public transport, as I first travelled on them in 1991. Having said that, no suburban railcars to grace the Adelaide metro system in the future will ever be even remotely like these old things. The new electrics will be ubiquitous, silent, and bland with no character about them whatsoever. Machines, just like an EFTPOS machine at a supermarket. Only identifiable by their fleet numbers, not by the groan of the engine unique to a particular unit, the exceedingly noticable smell of hot brakes, or the faded stripes that government penny pinchers could only afford to paint on one side of the door at the very front of the car, due to budget cuts 30 years before. An Elwood/PMCSA, in 1992. They regularly appeared on my local routes until 2003 or so. About 1955, when I was 4. Clarinda Transport's MBA bodied Seddon MK IV, like the one in my avatar. Ventura took over the route in 1957 and it is now part of the 733. My first bus that I remembered riding on was an antiquated High floored Renault PR180.2 from Southlands all the way to the city. Back in my days, these high-floored Transperth Articulated buses do not have any heaters during the nippy weather. These articulated buses have the window that allows fresh air especially on a hot day. The first vehicle I might have went on would probably have been a B59, but for an actual ride, probably a single door B58. I always nagged my mum to take me up to Aldgate so I could look for any remains of Jibilla station. As a not so average child, the word 'demolished' probably didn't register in my head at the time, but nonetheless, it got me a trip on one of these unique vehicles. I did ride T721s as well (operated by Lonsdale B58s), and T219s (now called G22X) which were run by SL200s. Yet here I am sitting here today wondering what MAN 18.280 2712 would sound at 100kph (it replaced 2427 or something (a renumbered ex STA B58). So used to catching computers on wheels today, as compared to real buses like the B58s and SL200s. Going back to around 1962,it was an ex TAA White. Thats my dad holding me at the time. Photo taken on The Esplanade at Semaphore South. when I was small in a reo prophets body of my relations mrs warrens Sydenham to Dulwich hill bus service route 222/227 & I was given 10/- om a Saturday to wipe down the buses with kero she would never use water.& late at night I WOULD RIDE the industrial buses & collect fares & on a suday all her buses would be used to take fans to Henson park football I WOULD collect the fares at sydnenham stn I WAS 13! 1106 in July 2014. Easily my best bus ride. I know I've caught many beforehand but the one that stands out clearly for me is in Perth. Leyland Worldmaster 1594 (594) in the early 1980s. From the front of my place in Armadale to the city. Former Route 219.